The Texans are looking to make an impact on the AFC playoff picture. Led by a powerful defense, the Texans are determined to claim the AFC South. In addition to battling the Dallas Cowboys for state supremacy, Houston looks to beat out rivals the Indianapolis Colts and the Tennesee Titans for division glory. Grab your Houston Texans tickets and head to NRG Stadium to cheer on your favorite football team. The Houston Texans may have been established in 1999, it wasn’t until three years later in 2002 they played their first season. The Houston Texans are the youngest team in the NFL and are members of the American Football Conference South Division. This pits the Texans against the Indianapolis Colts, Jacksonville Jaguars and the Tennessee Titans. Having made it to the playoffs regularly as well as winning their division in 2011, 2012, 2015 and 2016. The Texans unfortunately had a disapointing 2017 season, partly due to losing J.J. Watt to an injury in game 5. They finished their season 4-12 and subsequently did not make it to the postseason. But their poor performance is only more motivation to show up to play in 2018. It seems the Texans are all geared to finally take the 2018 NFL season head on. Houston’s first Division Title – On December 11, 2011, in front of a crowd of 41,202 at the Paul Brown Stadium, the Houston Texans finally broke the mold. Nine points down in the fourth quarter, third string quarterback T.J. Yates rallied the Texans to a 20-19 win over the Cincinnati Bengals. It was Yates 6 yard pass to Kevin Walter with two seconds on the clock that made the difference in the end. Yates and the Texans stellar performance gave the city of Houston their first division title. Yates to the Rescue Again – The Houston Texans invited the Cincinnati Bengals for their first playoff game at the Reliant Stadium on January 7, 2012. Behind 7 points at the end of the second quarter T.J. Yates who had stepped in for injured Matt Schaub and backup Matt Leinart took charge of the Texans offense. Yates finished the game with 159 yards and one touchdown as the Texans beat the Bengals 31-10. Since their establishment, the Houston Texans have been a part of many rivalries. These range from playoff rivals to the more intense traditional division rivals. Here is how the Texans have fared. Texans – Titans Rivalry – Perhaps fiercest of them all, the Tennessee Titans and the Houston Texans face offs are always full of fistfights and sometime all out brawls. As both are part of the AFC South, the two teams have met each other on 30 occasions with the Texans winning 16 of those encounters. On January 1, 2017, the Tennessee Titans snapped the Texans five game winning streak by winning 24-17 at the Nissan Stadium in Nashville. Bengals – Texan Rivalry – This Conference rivalry has also had its moments. The Cincinnati Bengals and the Houston Texans have gone up against each other on nine occasions out of which the Texans won 5 and lost 4. In addition to the on field skirmishes, the Bengals and the Texans have also exchanged unpleasant comparisons with Texans J.J. Watt calling Andy Daltons signature red hair Red Ryder BB Gun after they defeated the Bengals on Monday Night Football on November 16, 2015. Even though the Houston Texans have been around for a little more than 17 years, this football team has had many great talented players on its roster. The list for the Houston Texans starts with Wide Receiver Andre Johnson. Hailing from the University of Miami, Johnson made an immediate impact with over 300 catches and 17 touchdowns in his first four seasons. With Matt Schaub as quarterback, Johnson improved his percentage and made it to the five Pro Bowl appearances in 2004, 2006, 2008, 2009 and 2010. Quarter Back Matt Schaub is another Texan who needs no introduction in Houston. Schaub has 14.424 yards and 77 touchdowns to his name. He was a pro bowler in 2009 and for good reason too. He topped the league in pass attempts, passes completed, total passing yards and passing yards per game. In addition to the above, a few honorable mentions for the Houston Texans are Defensive End Mario Williams, Linebacker DeMeco Ryans, Cornerback Dunta Robinson and Kicker Kris Brown. NRG Stadium was the first retractable roof stadium in the NFL. The stadium includes over 8,200 club seats, 187 luxury suites, club lounges and bars. The newest additions to the stadium are two 50 feet high by 277 feet wide HD video/scoreboards, each above the end zones. Fans can now enjoy foods from local favorites while attending games at NRG as Bernie's Burger Bus and Demeris BBQ. So if you want to catch one of the most exciting teams in the NFL in action, then get your Houston Texan tickets from here. Our process for purchasing cheap Houston Texans tickets is simple and fast. There are so many online ticketing sites, that it can be hard for customers to find the right place to buy Houston Texans tickets at the cheapest price. At ScoreBig we think of our customers first and foremost. We offer daily deals for Houston Texans events, so our customers can get the best seats for the best prices. ScoreBig will always go above and beyond to offer the cheapest Houston Texans tickets on the market. The Houston Texans schedule above, displays all available events for 2019 and 2020. Once you find the event that you would like to go to, click the red “Get Tickets” button. It is located on the right-hand side of the event listing, it will take you to an Houston Texans event ticket page. ScoreBig's event ticket page will display all available Houston Texans tickets for that event. On the event ticket page to help with your search for the right Houston Texans tickets, use the filters at the top to select quantity, price range, and more. There is also an interactive seating chart so you can pick where you want to sit. When you are ready to buy a ticket, click on the listing, and you will be directed to ScoreBig's checkout page. Upon completion of the information fields, your order will be processed and your Houston Texans tickets will be delivered via email, mail, or to your mobile device. What makes ScoreBig’s site stand out from the rest? We are constantly analyzing our competitors to improve our site, service, and prices. ScoreBig.com employees strive to offer the best process and experience to buy cheap Houston Texans tickets. Our goal is to get you the best seats to Houston Texans events. We offer daily discounts on our site and for special promotions check out our newsletter. If there are no Houston Texans events currently available, you can use our search feature at the top of the page to see a list of all popular events going on near you. No matter your price point, we have all the best deals and discounts on Houston Texans tickets. For more information on prices of Houston Texans tickets and the schedule for Houston Texans, check out our listings above. The last thing you want to find out is when the Houston Texans event you wanted to go to is sold-out. Don’t worry in many cases ScoreBig has affordable tickets to sold out events. We sell tickets from GA all the way to premium seating and parking. Skip the scalpers in the parking lot and get your tickets online from top Houston Texans ticket brokers. We get you in all events, buy your Houston Texans tickets here from a brand that many trust and rely on for all their ticketing needs. ScoreBig offers a 100% money-back guarantee. If you have been in search of cheap tickets for Houston Texans, ScoreBig by far is the best option. That’s why ScoreBig has more loyal customers than any other ticketing site. 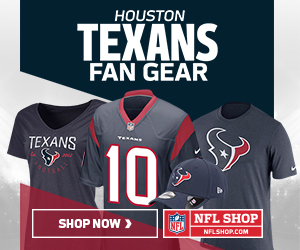 Shop at ScoreBig for safe and secure Houston Texans event tickets.